Hello all…sorry the posts are coming at such long intervals. I am teaching a new class this year — multivariable calculus! — and it is taking up lots of time as I try to remember/recreate/invent some level of understanding, having last taken the course 30 years ago. But I am having a lot of fun with it, teaching a small group of fine (and patient) students, learning a lot. Suppose the only geysers were A and B. If you have just arrived, Geyser A will erupt in x hours, where x is between 0 and 2. And Geyser B will erupt in y hours, where y is between 0 and 4. Intuitively, it seems likely that y will be greater than x. One way to see this is to use geometric probability. Think of every possible outcome as an ordered pair. Then, all possible outcomes can be represented as an area on the coordinate plane. 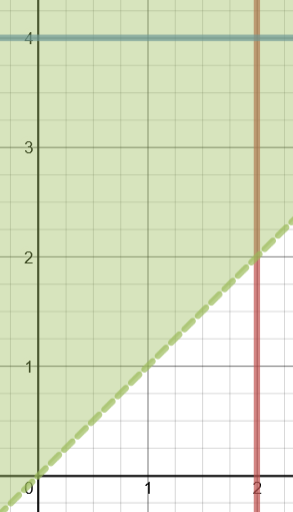 I used Desmos.com to graph the region and also the line y=x, or more precisely, the shaded half-plane y>x. Geyser A will erupt first whenever y>x. 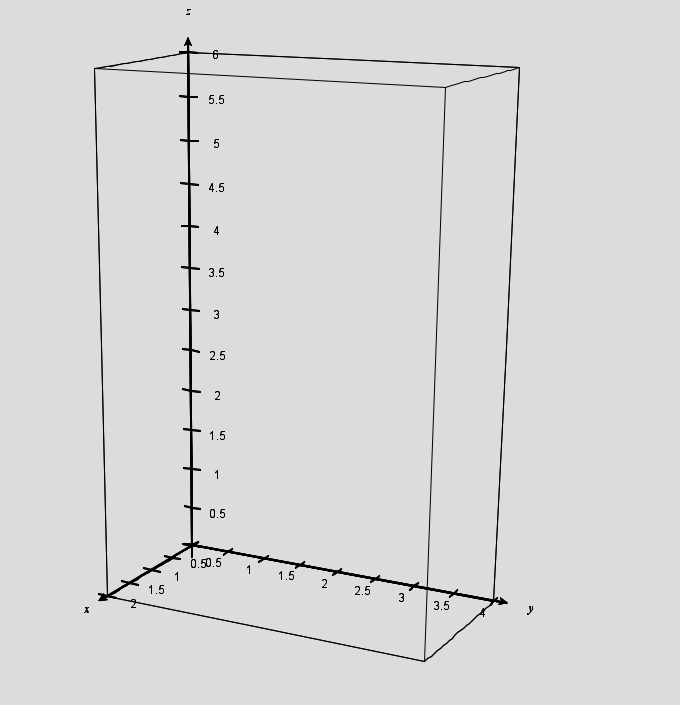 So the probability we seek is the area of the part of the box above the x=y line divided by the total area of the box. You can just about count boxes to determine that this occurs 6/8 (or 3/4) of the time. From the moment you arrive, you know that Geyser C will erupt in z hours, where 0<z<6. But you can still use geometric probability. Each outcome can be thought of as an ordered triple (x,y,z). The space of all outcomes is now a 2 x 4 x 6 rectangular solid. 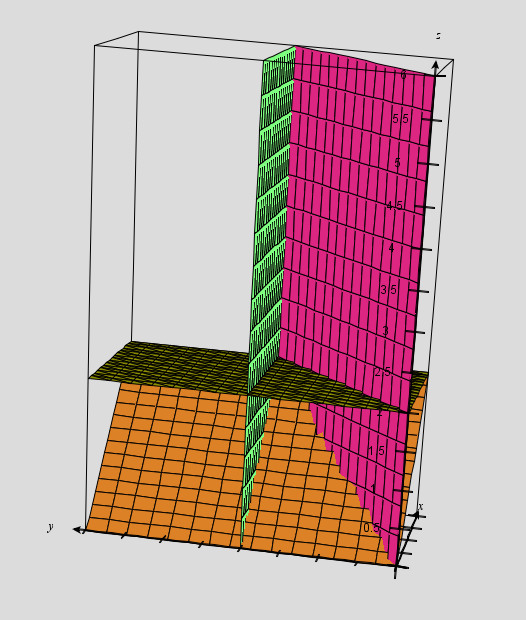 And if you are looking for the probability that Geyser A erupts first, you want to slice that solid up with the planes x=y and x=z. Note: on my computer, I can only open this page in Firefox. YMMV. 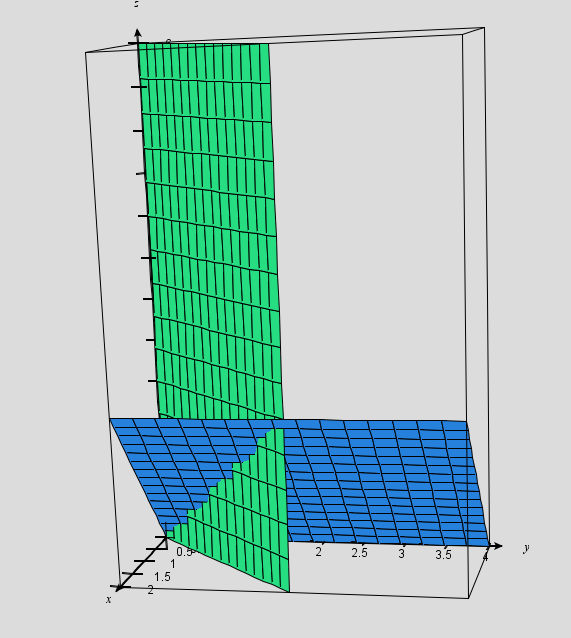 In this diagram, the volume defined by points where y>x and z>x can be broken into four chunks. I’ve added the x=2 plane and the z=2 plane to help you see them. (16 + 4+ 8 + 8/3)/(2x4x6) which reduces to 23/36. Using a similar method but with different cutting planes, you can find the pictures that will give you the probabilities of Geyser B or Geyser C erupting first. And you do get the same answer that is posted on the Riddler’s webpage. The word is “exponential”. It’s been showing up on my students’ tests and in their lab reports. And, like Inigo Montaya, I have to say: I do not think it means what you think it means. Here is a position vs. time graph from my student’s first test of the year. Yes. The slope tangent line is getting steeper. Yes. If the velocity were constant, the graph would have been linear. It’s accelerating because the graph is increasing exponentially. I don’t take off credit (yet) but I do wish we could sort this one out. So let’s try. where a and b are constants and x is the exponent.. And as long as b is greater than 1, the graph of the function will in fact curve upward. 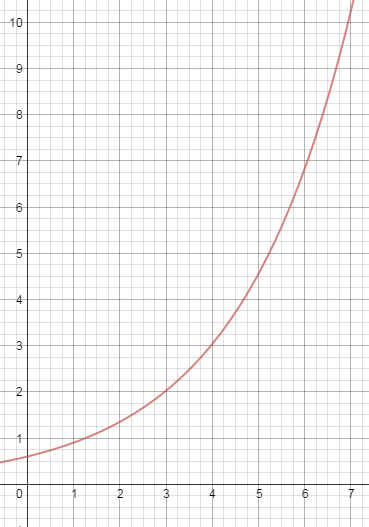 For example, here is the graph of a function that is in fact exponential. I don’t want to reveal what function it is just yet. 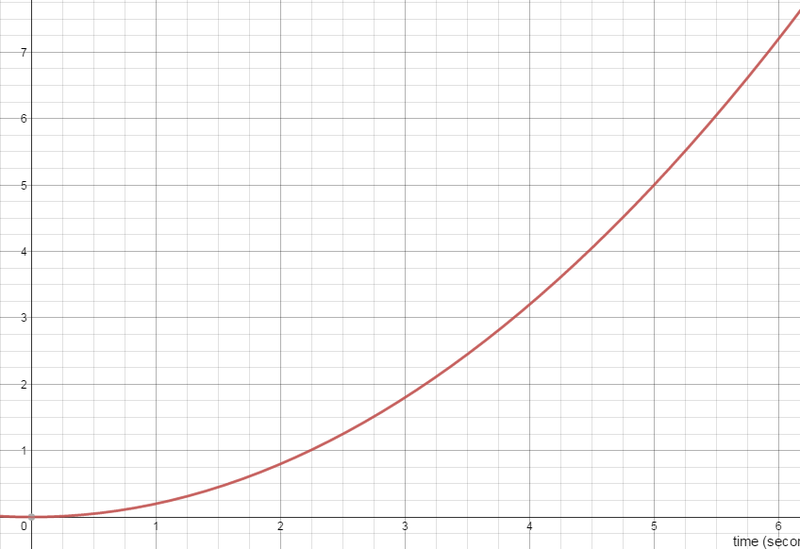 And here is a quick way to see if the function is exponential: look at how much it increases in equal x-intervals. A linear function will increase (or decrease) by the same amount in each interval. But an exponential function will increase (or decrease) by the same factor in each interval! 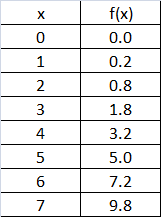 So now let’s take a look at the values of this function at regular intervals. In this case, I’ll just use Δx =1 and I’ll read the values off the graph as best as I can. 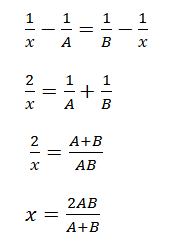 As you can see, as x increases, the function increases, but not by equal amounts. That’s ok — we weren’t expecting equal increases. The function is not linear. But if you calculate the ratio of any two successive values, you do see that the function is increasing by (nearly) the same factor every time! (You can trust me, or you can actually do the math.) This means that you are justified in suspecting that this curve really is “exponential”. And you can figure out the equation by inspecting the graph and chart. I’ll call that a puzzle — leave your answer in a comment (or if you are my current student, you can also post your answer in our class stream). 1. 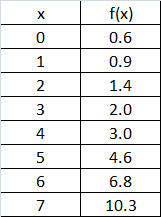 The values increase, but once again, not by the same amount each interval. This one is not linear either. 2. The ratio of successive terms is NOT constant. Try it and you will see. This graph is NOT exponential. But there is a pattern to be discovered here. Instead of finding the ratio of successive terms, try calculating the difference. You will discover a pattern, one that is true for “quadratic” functions. Tell me about it in the comments if you like. Bottom line: curved does not automatically mean exponential. Exponential means increasing by equal factors in equal time intervals. OK, even I will admit that the logarithm rules do not seem to be infused with joy. But once you know them, there is a way to apply them that my physics students seem to get a kick out of. It’s a little exercise I learned by reading Professor David Mermin’s essay, “Logarithms!” in his excellent book, “Boojums All the Way Through” (Cambridge University Press, 1990). The goal of the exercise is to be able to determine common (base-10) logarithms without a calculator. At the time Mermin wrote, scientific calculators were actually not so common. Now, everyone has access to them and Google will calculate them for you as well. But that’s not the point. It feels almost magical to be able to do this stuff without a calculator. I would say it’s a hoot, definitely worth of the exclamation point Professor Mermin put in the title of his original article. Here’s the basic plan. Start by observing some coincidences, some “almost” equalities involving powers of small prime numbers and small powers of 10. Then use the logarithm rules to deduce the values of the logarithms. So we would be almost correct saying 210 = 103.
but we know that log 1000 = 3. I have never presented this to a class without at least a handful of kids grabbing their calculators to see if we are close. Their calculators tell them that log 2 = .3010 and I hear “Whoaaa!” (but I teach an impressively nerdy group). Now what about log 3? We need another coincidence, another “almost” equality. 34 = 81 which is almost 80. This is helpful because 80 is also 10×23 . And when check out log 3 on your calculator, you see .4771….whoaaa. Like 72 = 49 ≈ 50 = 100 ÷ 2. Or 112 = 121 ≈ 120 = 10 × 22 × 3. These starting points expand our collection of approximate logs. But you have to know your log rules to build the collection. He then goes on to improve on all of these estimated logs by constructing systems of equations built on closer, dazzling coincidences. I recommend the essay and in fact the whole collection. In Advanced Math for Young Students, there is one section where I introduce a method to help students when they are stuck at the beginning of a word problem, not yet seeing how to translate the problem into the language of algebra. Well, I have developed a workshop about this method and have been invited to present it at Labyrinth Books on Nassau Street in Princeton. The presentation will be on June 11, 2015 at 5:30 pm. If you are in the area, stop on in. But if not, check back here in mid-June. I will post more about the method and include a link to the PowerPoint slides. That one is also only “true” when the small angles are measured in RADIANS (as you will see if you bravely read on). Once you accept these two things, you can go on to derive other interesting rules about interference patterns and about the behavior of pendulums. But why should anyone accept these things? I’m going to give you a collection of reasons. 1. Look at the numbers. 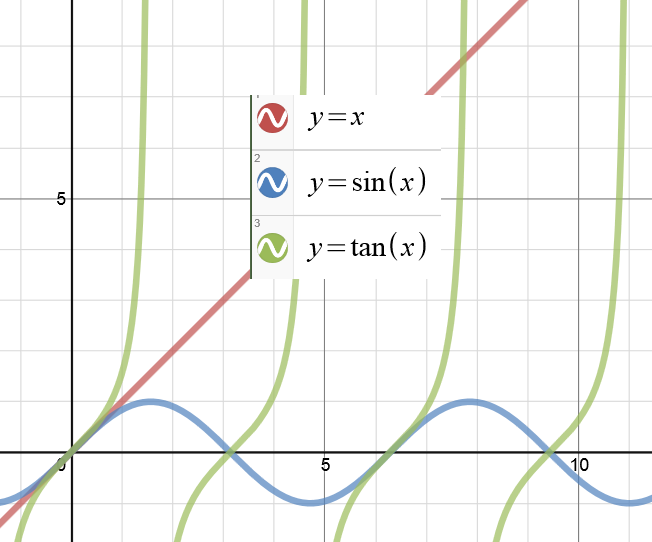 The chart above shows you values of the angle in degrees and then the sine, the radian value and the tangent listed in that order. You can see that the values are close to each other. 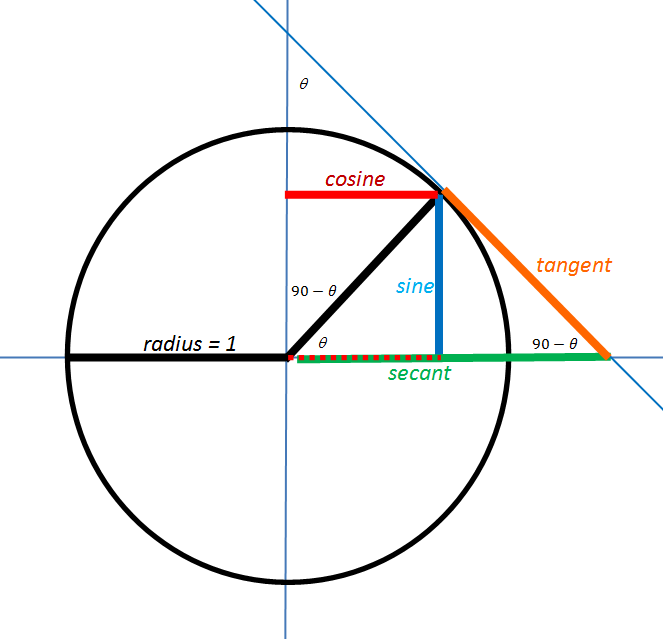 The sine is a little less than the radian measure and the tangent is a little greater. But even for angles as big as 20 degrees, the differences are less than 5%. So just looking at the numbers, you have to accept that for small angles, these three functions — sin(θ), tan(θ) and θ — are equal-ish. This is something that students learn later in their first year of calculus. These non-polynomial functions can each be expressed as a polynomials with an infinite number of terms. And they can be approximated with polynomials of finite length. Notice that the first term is the same: it’s just ‘x’. Then, after that, the next term has x-cubed. But if x is already small, then x-cubed is going to be REALLY small. Negligibly small. 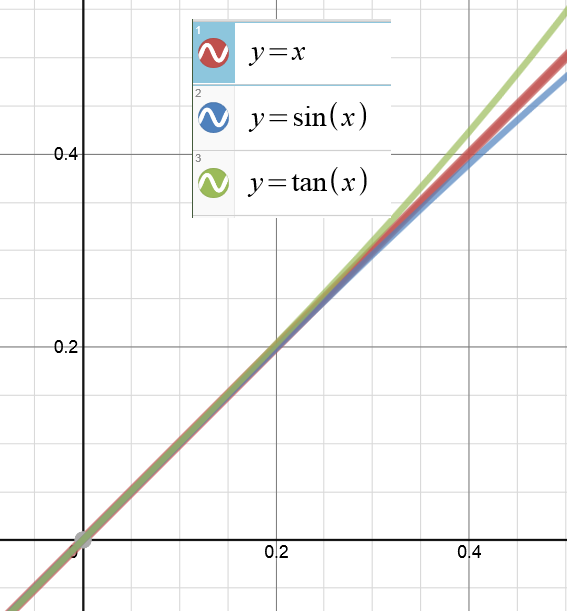 As we already expect from looking at the charts and graphs, sin(x) is a little bit smaller than x and then tan(x) is a little bigger than x. But for small values, the differences are negligible. Now look at how the lengths of those two segments compare to the length of the arc. One of them (the sine) is a little shorter. One of them (the tangent) is a little longer. But as the angle gets smaller and smaller, the differences become negligible! Well, I hope one of these four methods have convinced you that this is legal. If not, I hope at least that you enjoyed the joke at the beginning. 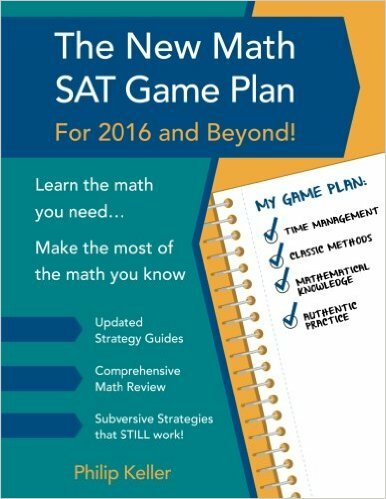 Most of my posts so far have addressed high school level math. This one is for younger students (and their teachers). At another blog that I follow, Kitchen Table Math, there has been recent discussion about the “invert and multiply” rule for dividing fractions and whether it is important and/or appropriate to teach the reasoning behind this rule. You know I am going to vote “yes”. But what kind of derivation should we use here? Mr. Novak’s explanation is elegant and concise. And it certainly answers the question: why do we invert and multiply in order to divide fractions? 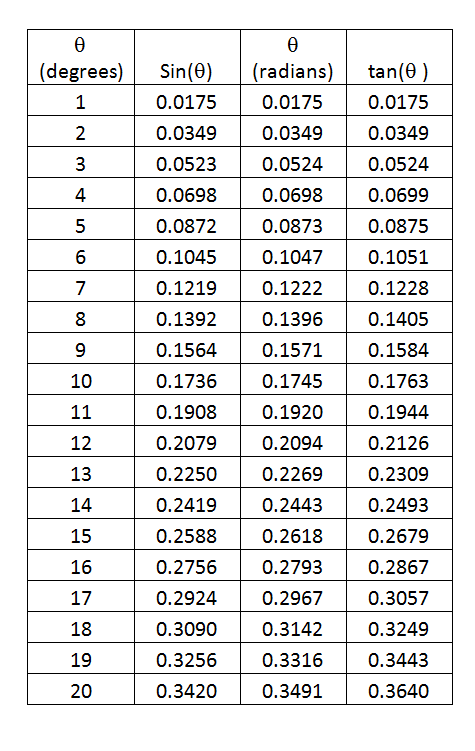 But it would be nice if students also had an intuitive feel for why this works. We can build the rule step-by-step in a manner that helps that intuition to develop. If I am putting ½ in each bag, then each cookie is enough for 2 bags. So 12 cookies fill 24 bags. I guess that must mean 12 ÷ ½ = 24. The trend has continued. Dividing by a smaller number gives a bigger answer. And even if you don’t know the rule for dividing by fractions, you can certainly divide by these fractions! To divide by “one over anything”, just multiply by the denominator. STEP 3: Any fraction at all! Suppose you have those 12 big cookies and you decide to give everyone (2/3) of a cookie. How many servings can you make? We can figure this out using the reasoning we followed above, with one extra twist. We have already seen that if you want to give everyone just (1/3) of a cookie, you will have enough to fill 12 × 3 = 36 bags. But now you decide to give everyone TWO thirds of a cookie. But you have already filled all those bags – why not just give everyone two of the bags? You will have enough for 36 ÷ 2 = 18 servings. Now go back and look at how we got that answer. We don’t have to know an official rule to divide the 12 cookies into servings that each have 2/3 of a cookie. We can just multiply by 3 and then divide by 2, which is the same as multiplying by 3/2. Suppose you have 36 pizza pies to sell and you want to give 3/5 of a pizza to each customer. (No one cuts pizzas into fifths, but don’t worry about that.) How many customers can you serve before running out of pizza? Well, if we give everyone ONE fifth of a pie, we can feed 36 × 5 = 180 customers. Giving everyone THREE fifths means that we can only serve 180 ÷ 3 = 60 customers. So to find 36 ÷ (3/5) we multiply by 5 and then divide by 3 which is the same as multiplying by 5/3. If I could only show students one explanation, I would go with Mr. Novak’s. But if I had time to explore and play, I would start with what you see above. I like that it encourages number sense and intuition. Also, it introduces an idea that students will see again many times: that existing patterns can be extended to cover new situations. Here’s a quick addition to that last post on various types of means. By coincidence, yesterday, a question came up in my AP physics class about the meaning of the average radius of an ellipse. 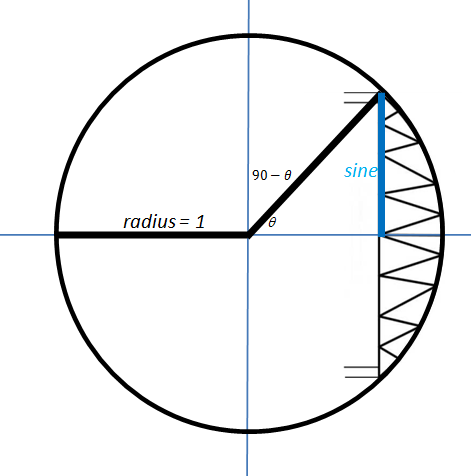 I’m not sure how useful it is to find the average radius of an ellipse, but it is interesting — and better with a picture! The distance from the center of a circle to any point on the circle is a constant — that’s the length of the radius. 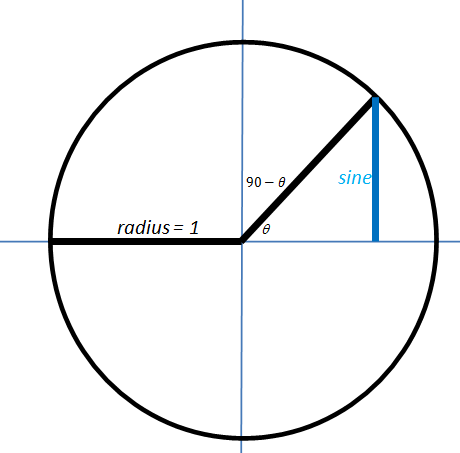 What is the radius of the circle that would have the same area as the ellipse? 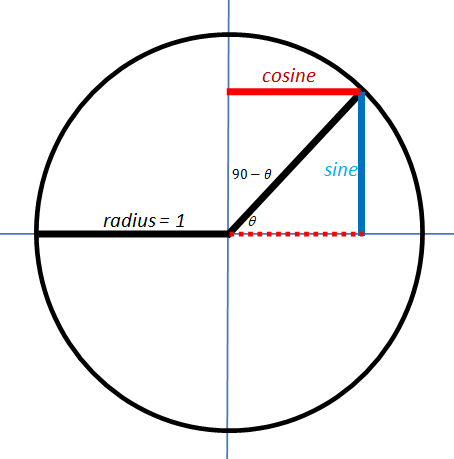 Clearly, that radius would have to be more than b and less than a. So maybe it is their mean…but which kind of mean? So if the two areas are two be equal, we need r2 = ab. 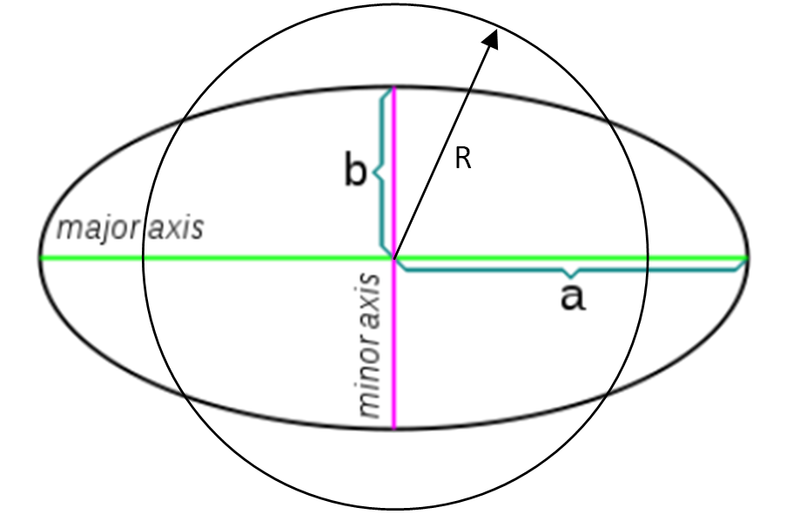 For a circle to have the same area as an ellipse, the length of its radius must be the geometric mean of the lengths of the ellipse’s semi-major and semi-minor axes! I didn’t know that. And I was surprised to see a geometric mean pop up in class so shortly after my last post. Also, I should add: I don’t know how to show that the semi-major axis is the average orbit radius. If any of my fine students can come explain that to me, it is certainly worth a little extra credit. One of my very favorite students greeted me this new year with a question: what are the different kinds of means? This is a fun question to explore. We are going to look at three kinds of means, each associated with a type of sequence. Suppose we start with two numbers. Their mean is a number that lies between them. But exactly where it lies depends on what type of mean you are talking about. We have A, x, B and we want the differences to be constant. This probably does not surprise you. The arithmetic mean is also just the average. 45 – 30 = 60 – 45 = 15. So the sequence is arithmetic. 45 is the arithmetic mean between 30 and 60. You drive for two hours at 30 mph and for two hours at 60 mph. What is your average speed for the trip? When you solve this, you will discover that when you drive at different speeds for equal time periods, your average for the trip is the arithmetic mean of the two speeds. We have A, x, B and we want the RATIOS to be constant. For example, if A=9 and B=16 then the geometric mean x = √(9×16) =√144 = 12. 12/9 = 16/12 = 1.333… so yes, the sequence is geometric. 12 is the geometric mean of 9 and 16. In the triangle above, if x = 9 and y = 16 determine the height, h.
You can use similar triangles to show that the height of that altitude is equal to the geometric mean of the lengths of the two segments on the hypotenuse. 1, 1/2 , 1/3, 1/4, 1/5… is harmonic. Its reciprocals are 1, 2, 3, 4, 5… which is clearly arithmetic with a common difference of 1. We have A, x, B and we want the difference of the reciprocals to be constant. 6/240, 5/240, 4/240…sure enough, the reciprocals form an arithmetic sequence. You drive to work at 40 mph and then you drive back home at 60 mph. What is your average speed for the trip? You can solve this by calling the length of each leg d, finding the time for each leg of the journey, adding to get the total time and then using total time and total distance to find average speed. When you are done, you are in for a surprise. When you travel equal distances at two different speeds, your average speed for the trip is the HARMONIC mean of the separate speeds. I’ll close with a question: why is this called “harmonic”? Does it have something to do with music and harmony? We almost have the whole picture in view. In this diagram, the secant line segment is adjacent to the central angle θ. And the tangent line segment is opposite that same angle. But what if we want to draw our secants and tangents relative to the central angle 90-θ, the complement? 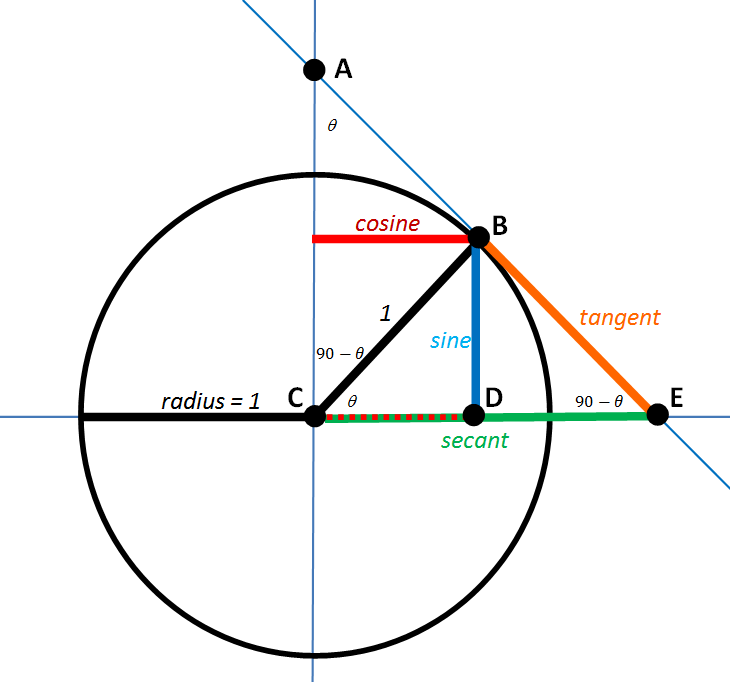 Let’s add those segments to the diagram and call them the cosecant and the cotangent. Those two exercises reveal a lot of information all derived from that one diagram. Once again…it’s better with pictures. The blue segment is called the “sine” of the angle. It gets its name from a word that means “bowstring”. 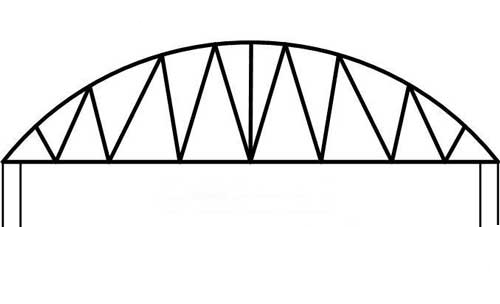 Here is a diagram of a bow string truss. We can call that red segment the “bowstring of the complement”, or the “complement’s sine.” Or we could just call it the cosine! Now we are going to add two segments to the diagram: one that just touches the circle and one that crosses the circle. We will use the same names we used for these back in geometry class. As you can see from the labels, the orange one is called the tangent and the green one is the secant. Now we have arrived at the key step. Take a moment to convince yourself that ΔEBC is similar to ΔBDC. These are NOT arbitrarily chosen definitions. They follow by necessity from the geometric definitions of these terms. I will pause here to allow everyone to catch their breath. In the next post, we will finish developing the diagram and add in the Pythagorean identities.